Liliana Bloch of Liliana Bloch Gallery, Holly Johnson of Holly Johnson Gallery, Cris Worley of Cris Worley Gallery & Nancy Whitenack of Conduit Gallery. Not pictured, Ree Willaford of Galerie Urbane. The art scene in Dallas has long been influenced by avant-garde women: From the The Betty McLean Gallery, which opened in 1951 as one of the first modern art galleries in Texas, to Valley House Gallery, founded by Peggy and Donald Vogel, to the visionaries of today who show no signs of slowing down. When Nancy Whitenack opened her contemporary art gallery in Deep Ellum in 1984, she knew art was her calling. In 2002, after a stint in a second location at 3200 Main Street, where Danette Dufilho joined as gallery director, Whitenack made a pioneering move that helped change the landscape of Dallas contemporary art galleries. She relocated to the Design District. Whitenack also plays a leading role when it comes to art as advocacy. She says, “It is something I am adamant about,” citing Conduit’s hosting of “Cocktails for a Cause,” a charity event that benefits to Planned Parenthood. She is also very active in Contemporary Art Dealers of Dallas (CADD), established at the turn of the millennia which, among other activities, raises money for recent art school graduates and hosts very popular art bus tours. Before CADD, the Dallas Art Dealers Association (DADA) was the only organization of its kind in town, with members ranging from traditional art galleries to non-profit organizations. It was formed in the 1970s by Edith Baker and June Mattingly, two of the cities most influential gallerists. DADA is still thriving today but some women, including Whitenack, recognized the need for a singular focus on and support for the issues specific to those galleries dedicated to contemporary art exhibitions. It was through DADA that Liliana Bloch, whose gallery is also now located in the Design District, developed professional relationships with member institution McKinney Art Center and The Public Trust. But Bloch’s love for art started with a love for reading. At 18 years of age she wanted to study literature or history, but as her home country of El Salvador entered a civil war, her parents urged her to study something “useful” so she could find employment anywhere. She decided to study economics and went on to get an MBA in marketing, drawn to what she considered to be the more creative side of the business—decisions that served her well. When Bloch moved to Dallas approximately 16 years ago, the cultural landscape took her by surprise, and so she took refuge in the art museums. As Bloch’s love for and exposure to art increased, she was invited to become a board member of The McKinney Avenue Contemporary. Later, by what she considers a major stroke of luck, she stepped into the role of interim director of The MAC, a position that allowed her to apply her business experience while nurturing her love of the arts and artists. “Art puts you in context, it gives you references of place and time” says Bloch. “It is our freedom to think, to talk, to expose our minds to all ideas and hopefully make informed decisions fostering critical thinking. Art is an ongoing conversation, not an absolute statement”. Also on Monitor Street is Galleri Urbane, owned by Ree Willaford, a woman full of energy and ingenuity. Originally, she launched the gallery as a series of private dinners and art viewings in her home in Silver City, New Mexico. Ready for a challenge, and with momentum building, she decided to rent a space for a pop-up gallery in Marfa during Chinati Open House weekend. She and her husband bought their own building in 2003. Today, the gallery maintains a presence in Marfa through exhibitions in the Exhibit Lounge in the Thunderbird Hotel. As more and more art lovers from Dallas were visiting Marfa, Willaford took note because she was considering moving to a larger city for her daughter’s schooling. They took the plunge and relocated to Dallas, opening the gallery there in 2009. Like Whitenack, Willaford’s move was a pioneering one. Opening her business (against the advice of most colleagues and friends) on Monitor Street which was, at the time, a dead-end, dilapidated industrial section of the Design District, was risky. “Everyone told me not to do it, that no one would come to a gallery ‘way out there,’” says Willaford. “But I knew it was a great opportunity and, once I saw the building, I knew it was the right thing to open the gallery there. It was only a three-minute drive from Dragon Street, there was plenty of parking and, the greatest thing was that we had green space. A little oasis in this industrial area.” After a bit of tearing out and building out, the gallery welcomed curious visitors, new and seasoned collectors and, of course, artists. Monitor Street now boasts new residences and, as mentioned previously, additional galleries and that once dead-end feeds into green space and the Trinity hiking trail. Willaford’s past professional experiences in retail merchandising, commercial art consulting and buying, and even the food industry, equipped her for the juggling act of running a gallery. She has a keen eye for new talent and, frankly, cites a deep love for art as the main reason she opened Galleri Urbane. “I can’t get away from it,” she says affectionately. Similar to Bloch’s arrangement with The Public Trust, Galleri Urbane was home to Cris Worley Fine Arts, yet another gallery that now calls the Design District home. Worley, an Alabama native, has been in Dallas for approximately 20 years. After several years in Seattle, then studying art history at Southern Methodist University, paired with studies abroad and working in the school’s Pollock gallery, she was offered a director position at Karen Mitchell Frank Gallery—what Worley describes as her big break. From there, she went on to work at Pan American Art Projects for seven years, where she gained experience in art fairs, private collections, and secondary markets. Worley recalls the early days of her namesake gallery in the building she shared with Galleri Urbane. She and her staff would work not in an office adjacent to a spacious gallery as they do now, but on a bench with their laptops in a 600 sq. ft. exhibition space. After two years there, she is now located on Levee Street, next door to her friend and colleague Holly Johnson Gallery. Those experiences feed her exhibition program today. “I like to see a dedication to a craft or skill, that is the common thread among my artists,” she says.”Successful execution of a good idea is a rare thing, but it’s what I look for.” Keep an eye out for Future Glow, an exhibition of large scale paintings, the third solo exhibition with Trey Egan, on view Sept. 9 through Oct. 7. She opened her namesake gallery in 2005 on Dragon Street and relocated to her current spot on Levee Street in 2015. This year she celebrates the 12 year anniversary of a program that boasts eight annual exhibitions, primarily solo shows, with a roster of mostly mature artists from throughout the U.S. Plus one artist from Scotland, because “I just couldn’t help myself,” she laughs. 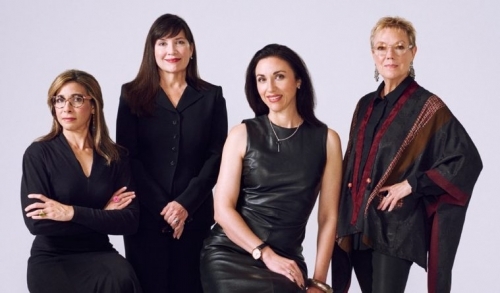 The gallerists named here are just a handful of women leading the contemporary art scene in Dallas. Joan Davidow, former director of Dallas Contemporary, opened Site 131 last year; Gina Orlando co-owns Circuit12; and Mary Tomás of Mary Tomás Gallery, Lindsey Carneal of Carneal Simmons Contemporary Art (gallery and sculpture garden), and Missy Finger from Photographs Do Not Bend (PDNB), dedicated to photo-based artworks, amongst others, are also very active in the District. Readers may want to broaden their perspective in order to say ahead of the trends, taking note that female gallerists are leading the art scene on either side of the Trinity River as well. For example, not far from SMU Meadows Museum and Pollock Gallery is a respected art world heavy-hitter Talley Dunn, and Erin Cluley is going strong into her third year on the west side’s Fabrication Street. Cluley, former exhibitions director at Dallas Contemporary, found her gallery space as a result of her working relationship with Trinity Groves investor Butch McGregor. Her roster includes local contemporary favorites such as Nic Nicosia and intriguing artists like René Treviño, whom Cluley met during her years in Baltimore. And just south of Trinity Groves is the Bishop Arts District, where the trained architect and gallery newcomer Jen Mauldin is making waves.